Eighteen eco-friendly electric scooters (eScooters) have been put into operation at the Vietnam-Germany University in Thu Dau Mot city in the Southern province of Binh Duong on December 5. 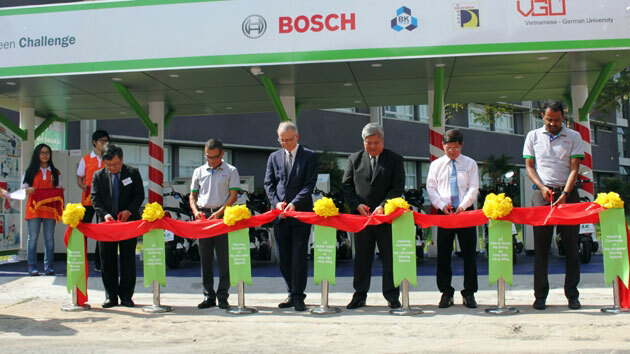 The vehicles are part of a project jointly implemented by Bosch Vietnam and the HCM City University of Science and Technology, Da Nang University of Science and Technology and the Vietnam-Germany University. In this project, students of the three universities won the the 2015 Green Challenge contest jointly organised by Bosch Vietnam and the three universities. The German company has provided more than 4 billion VND (182,000 USD) for this pilot project. This is the second batch of eScooters launched for public use in Vietnam, following the first at the HCM City University of Science and Technology. The third one is also expected to make debut at Da Nang University of Science and Technology this month. The project aims to promote research and development of environmental-friendly vehicles among enterprises and universities, thus contributing to tackling traffic and environment challenges to develop smart cities. Students of the university, who have motorbike-driving licenses can use the eScooters for free within their campuses by registering online at http://bosch-green-challenge.com.vn. A fully-charged vehicle can travel up to 80km at a maximum speed of 45km per hour./.